Mornings are always hard and especially so when you’re facing a really busy day. But today your life is about to get a little easier because five things are about to go away. Yes, I’m giving you permission to eliminate 5 things from today’s list. Well slow down for two minutes and evaluate your day. You may find that you can create a more realistic to-do list that focuses only on what really needs to get done. Delegate it: There is usually someone better suited than a busy you to handle the task. The key is to not spend a lot of time micromanaging… just ask nicely, establish your expectations, give a timeline, check-in once to see how it’s going, and take responsibility for the outcome. Reschedule it: One of the tasks on your list can certainly be done another day over the next month. Open your planner and choose a day when you’ll be able to focus your time and energies to it, and give it the proper amount of attention. Save it: Put one of your tasks on a “someday” list, and do it another day when you can devote more time. This is a great way to pause (but not forget) a personal activity such as a hobby that you haven’t completely decided on. Just don’t put your dreams on hold too long! Delete it: Face it. 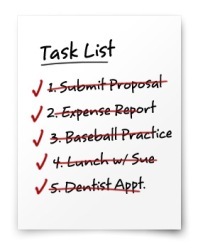 One task on your list just isn’t that important right now. Cross it off. It will return one day if and when it’s important enough. Look, I get it. Human nature implores you to bite off more than you can chew. There’s only so much time in the day and people almost always tend to overestimate the time they have available. This is especially true when you don’t leave room for the unexpected. Eliminating 5 tasks is a good way to keep yourself honest, and in the habit of planning your time carefully and conservatively. Now go have a great day! ← Where Will You Buy School Supplies This Year? Making a list seems hard when you leave everything to memory but it gives a realistic picture of priortizing and determining what needs to be done now and what needs to be done later. It seems more attainable with a visual task lists that gets eliminated one at a time. Thanks Day-Timer for reminding me that it is best to still write it down! Thank you for this article. I received the e-mail just when I needed it. Glad you enjoyed it Suzanne. Good luck with your planning. Sometimes the simple tips are what hit home the hardest. Good luck Frank, thanks for commenting.